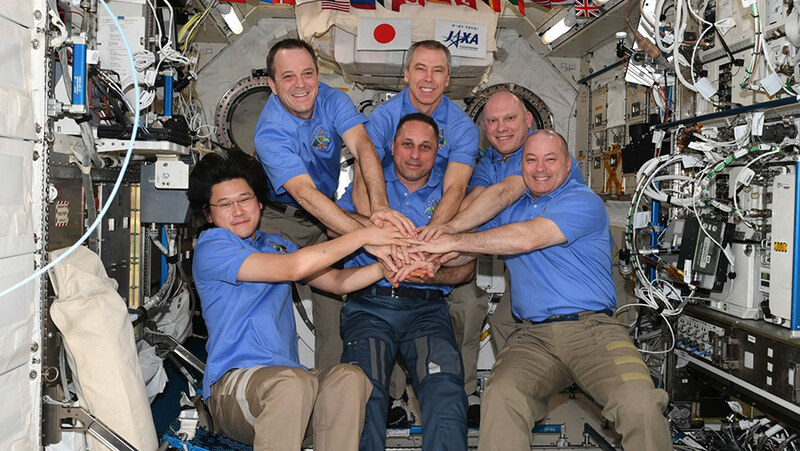 The six member Expedition 55 crew poses for a portrait in the Japanese Kibo laboratory module. Ricky: Hey Maker, is this your smoothie? Drew: Hey Ricky, don’t drink my smoothie. Ricky: What smoothie? This one has my name on it (as he writes his name on it). Drew: Okay, Grandpa Underpants, hands off my smoothie. Ricky: Okay, Feustelnaut – we have rules around here, so this is my smoothie now! One the hardest things to do in space is to maintain positive control of individual items such as tools, spare parts, fasteners, etc. We try very hard not to lose things, but even with all of the attention and positive control, items can still float away and disappear. We generally hold items in a crew transfer bag (CTB). Inside the CTB are many items for the system that it supports. When the CTB is opened, the items are free floating inside the bag and tend to escape. It is very difficult to maintain control of the items – especially if they are small, do not have Velcro, or when the daily schedule is so tight that we are rushing to stay on time. We always try to close the CTB’s and Ziploc bags after removing or replacing each item to maintain positive control, but this takes much more time to do for individual items, and if the timeline is tight, we absorb more risk by rushing. The same applies for tools, which we usually keep in a Ziploc bag while working on individual systems and tasks. Last month, I was installing a new low temperature cooling loop pump that had failed a month or two earlier. I gathered the needed tools into my modified (with Velcro) Ziploc bag as I always do and floated over to the work area. When I got there, one of the tools that I had gathered was missing. I looked for 30 minutes, and could not find it. Lost items are very hard to find because the items that escape are usually barely moving and blend in with the environment very quickly. A lost item could be right in front of us and we would never see it. Our crew, after learning these lessons, decided that when anyone loses something, we would tell the other crew members what we had lost with a general location. This has had a huge impact on finding items. If a different crew member can help within the first minutes of losing an item, the new crew member has an excellent chance of finding the item. We have proven this technique several times during the expedition – and Nemo was the very best at quickly finding lost items. But, in my case, we still could not find the missing tool. Our amazing ground team understood and vectored me to a replacement tool and I finished the job. I spent the next 3 weeks watching, looking, and never forgetting about the lost tool. Then, one day last week, Oleg came to the lab and handed us a tool he had found in his Soyuz spacecraft, way on the aft side of the ISS. Amazing. We finally found the tool and I was happy again. This was a lucky ending. ISS has many corners, crevices and hard-to-see areas where missing items could hide and never be found. We captured a Cygnus cargo craft last Thursday. I was very impressed with the entire team. Our specialists and training professionals in Mission Control did a great job preparing the necessary procedures and making sure we were proficient and ready to conduct operations. The robotic arm is a wonderful system that we could not operate ISS without. Being in space, however, it has some very unique handling qualities. If you think about a spring-mass-damper system just as you did during physics or control theory class, and then remove the damper, you will see a system that is very subject to slow rate oscillations. In test pilot terms, damping ratio is very low and the latency is well over a half of a second. Also in test pilot terms – this is a pilot-induced oscillations (PIO) generator. These characteristics require crew to “fly” the robotic arm using open-loop techniques, which requires a huge amount of patience. Test pilots are sometimes not very patient, but understanding the system and practicing with the incredible simulators that our ground team built and maintain help keep our proficiency as high as possible. The capture went flawlessly, and I was very impressed with the professionalism across the board – crew, flight controllers, and training professionals – what a great job! Drew, Ricky and I got to play guitar a few times while on ISS. This was fun! Drew connected pickups to the acoustic guitars and then connected the pickups to our tablets for amplification. I’ve never heard an acoustic guitar sound like an electric guitar amped up for heavy metal before. We had a great jam on the song “Gloria”, and a couple others. Rock on! Last night we had our last movie night. The entire crew gathered in Node 2 and watched Avengers Infinity Wars on the big screen. We enjoy each other’s company, as we did during Expedition 54, and this was a welcome break from the daily grind of trying to complete the required stowage, maintenance and science activities while preparing for departure. Our last full weekend here on ISS. I gave myself a haircut. We usually clean our spaces each weekend to make sure we can maintain a decent level of organization, efficiency and morale. This weekend is no different, and it is time for me to vacuum out all of our filters and vents. You’d be amazed at what we find!